Courage finished up a gymnastics class about a week or two ago. Mom was supposed to be taking Courage to these classes, but Courage much preferred to have here Dad take her instead (which is odd since she prefers Mom for most other things). 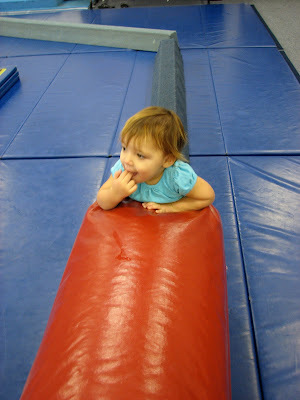 Ergo, the last couple of class sessions that she had, I took her and watched her do her toddler tumbling thing. Watching her in a classroom type situation made me think about how different she is from Titus (I think that Titus and Courage look like identical twins, so I am usually somewhat surprised when I find differences between them). 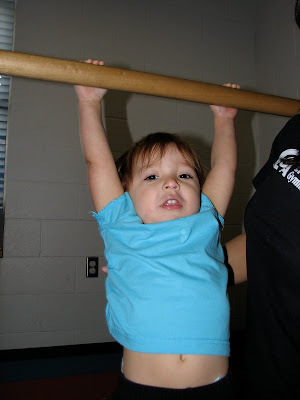 Titus took the same gymnastics class when he was around the age that Courage is now. The main similarity between the two class experiences was that I was usually the only father in the classroom and most often the only one wearing a heavy metal or pirate shirt of some kind. As for Titus and Courage themselves, they were night and day. When Titus took the class he loved it. He loved having the structure, loved having someone show him how to do new things, and even tried to do the activities as prescribed by the class instructor. He was usually the first one to sit when the teacher asked and was the first one to volunteer when the teacher needed someone to demonstrate the days activities. And, after class he would even tell us about what happened in his class. Courage's favorite part of the class, on the other hand, was the free-play time at the beginning of each class (one time we got there about twenty minutes before anyone else showed up, and that was by far Courage's favorite day in the class). In fact, she liked that activity so much, she made every effort to turn all other activities in the class into free-play time. When the teacher called for attention, Courage scrambled to the other side of the room to do something else. When the teacher showed what to do with a mat or a beam or a ball, Courage used those things for something else. When the kids were supposed to run a circuit, Courage would run it backwards or in a random order and, more often than not, knock down the equipment right before some other kid wanted to use it. Her approach to classroom structure was quite different than Titus'. However, with all of that, Courage was the one who left the class being able to do a somersault on her own. We had to work with Titus ourselves at home before he could do one. So, despite their different approaches to the classroom, I'm glad they each found a way to make something out of their in-class physical education. I only worry about who is going to bully whom when they get into middle school together. Here are some pictures of both Titus and Courage in the respective classes. Samantha recently updated our family blog, so I thought that I needed to hop on this thing if I was going to keep up (and perhaps do more than three posts this year). Things have been busy for me, and I usually spend my free time playing with my kids, reading books, or playing guitar (sometimes all three of those activities at once). However, this year Samantha is planning on keeping me accountable on the communication front, so there may be more posts to come on this thing soon. Quick recap of everything that has been going on with me: I finished an M.A. in the summer and walked in the graduation this December (thanks to everyone who came to congratulate me). In the meantime I have started a Th.M., which I should finish this May. Classes have been fun, and I have been able to take some good Old Testament backgrounds courses, even translating some ancient Aramaic and Moabite. Titus started going to preschool on Fridays, and now he can write and read his name (we'll be working on doing that in Greek and Hebrew soon). Christmas vacation was a blast as I got to see a bunch of family. 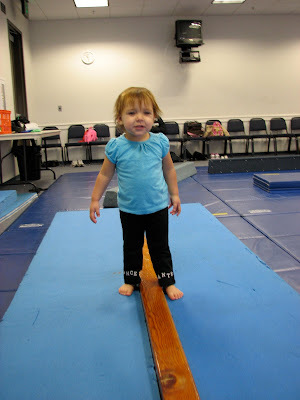 Courage just started a gymnastics class that she attends with her mom, and I started an online course for the winter inter-term (it's the life of Christ). I am looking forward to more classes when the semester starts in February, and I am looking forward to playing some more inter-mural soccer. I think that is everything important for now. Here are some pictures in no particular order. So, I see it has been a bit of time since I last posted on this thing. I guess I have done poorly on my New Year resolution to be more communicative over the internet. Well, to make up for it, here are a bunch of pictures to chronicle this last school semester. You can make up a story to connect the pictures together. The other day Samantha reminded me that I do, in fact, have a blog. So, in order to please her, I have made a new post. We had a good summer. We took the kids to the zoo and the beach, and Titus has learned how to swim. We took a few pictures. School has started (no pictures of this yet). The family is doing good, although sometimes it feels like we live in a tree after surviving some kind of shipwreck. At least, sometimes our house looks like a shipwreck. Titus' birthday is coming soon. I need to know if I should make his party pirate themed or based on the T.V. show Wipeout. Either way I think Titus is going to jump in the pool from our balcony. Happy Independence Day Everyone! We had a pretty good 4th of July weekend over here. My class officially ended on the second (although I still have homework due for it), so we decided to actually celebrate America's independence (instead of simply studying Athanasius' rhetorical method in his defense against heretics). The festivities started with a B.B.Q. and pool party on the 3rd. Unfortunately, Biola decided to rebuild the pool in our apartment complex, so instead of having a well manicured hole in the ground covered in plaster and filled with cool, clear water, we had a pit of dryish dirt and concrete chunks (not very cohesive for swimming). The cook did a good job though. After we finished the B.B.Q./un-pool party we walked down to Biola and watched the La Mirada city fireworks (because the leaders of this city think America declared independence on the 3rd, apparently). Titus liked them, Courage slept. On the 4th we bought batteries (hence the missing pictures from any events which took place on the 3rd). Then we continued to eat what we had made at the B.B.Q. the day before (we are still eating this to this day). This time we were with a different group of people at our old apartment complex, so Titus took a swim. After this B.B.Q./real-pool party, we hurried on down to Downtown Disney to watch their firework extravaganza. We almost made it there. It took us about five minutes to get from our place to the Disney exit, and then it took about an hour to get off the exit (it was a regular civil war out there, I've included a picture taken after traffic cleared up). A note for anyone trying to see the Disney fireworks on the 4th: Go Early. Even though we were stuck on the street in our car amidst a crowd of traffic, we did get to see the fireworks (we were facing the right way on the exit). The fireworks were pretty good. Courage liked them, Titus slept. The fun continued on the 5th, as we took Titus to his first theater experience (discounting when we took him to Happy Feet, since he was three months old and slept through the whole thing). Titus chose to watch Wall-E. As it turned out, this was a good choice. At least, Titus really liked the movie (and he still wants to watch the previews on the computer at home). Titus also liked walking up and down the steps in the theater during the film, and asking questions loudly about what happened to Wall-E during the slower parts. On the 6th I studied Athanasius' rhetorical method in his defense against heretics. We finally got the internet up at our new place. The lack of internet here has been my excuse to all who have complained about the lack of posts on this thing. Here is a quick catch-up of where we are at in the Owen family. My soccer team won the Biola intermural b-league championship. I finished the semester and have started summer school. I am taking two classes right now; the first one has one more session on Saturday, and the second class started this week. We moved to a new apartment (just down the street from where we used to be). Samantha and I are both working. Titus' gymnastics class is over, so he plays at home. Courage eats, sleeps, and spits-up. I've noticed that whenever this family enters into what is supposed to be vacation time we are much more busy than when we are on normal work and school schedules. I don't mean busy with extra activities even, I mean more busy with work and school. Well, at least summer classes are short (I should be done with them before the fourth of July). Also, I feel confident that I can take comfort in the fact that Titus and Courage are good looking kids, or so the pictures seem to indicate. Well, we had a baby. And, we even named the baby. Here are some pictures of Courage (like the cardinal virtue) Eudaimonia (it's Greek) Owen. Enjoy. Oh, by the way, Titus really likes his little sister. In a hole in the ground there lived a Michael. Or, Michael, his wife, Samantha, their son, Titus, and their daughter, Courage, are currently residing in a cozy apartment (it's a Michael hole, and that means comfort). Michael attends Talbot Theological Seminary, and would like some time to read books and play guitar.